Your flight must depart no earlier than: 21:00 on Day 10. This tour gives you a glimpse into the life of 42 different tribes of the country that make up Kenya's rich culture. Get a better understanding of village life by visiting homesteads and enjoy a display and sounds of folk dances performed. Entrance fee and hotel pick-up included. Take a stroll through this museum to get a better understanding of Kenya's rich heritage through a range of cultural and natural-history exhibits. Learn more about the region's bird population at the Birds of East Africa exhibit, a huge gallery of at least 900 stuffed specimens. Get a refreshing take on Kenyan history counterpoint to colonial historiographies at the Historia Ya Kenya display. Entrance fee and hotel pick-up included. Feast on a range of familiar and exotic meats roasted over an open flame barbecue pit. Ever wanted to try ostrich or crocodile? Here's your chance to do so (at a world-renowned restaurant, at that). Price includes the price of a meal (without a beverage) and hotel pick-up. Masai Mara is one of the world’s top safari destinations, known for its abundance of big cats - cheetahs, leopards, and lions - as well as the two million wildebeest, Thomson’s gazelles, and zebra that migrate annually across the vast grasslands in search of water. 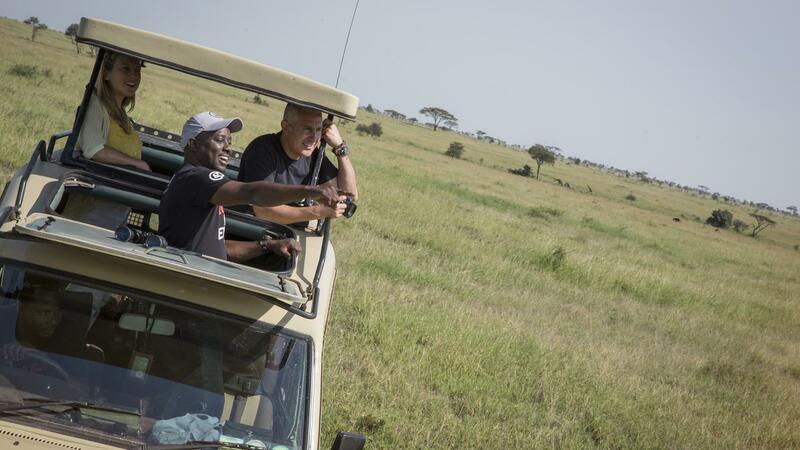 Set off on safari with our driver/guide and keep your eyes and ears peeled for movement and memories. Watch elephants and giraffe grazing, photograph zebras and wildebeest, and with a little luck, you'll even spot animals feasting on a recent kill. Explore the area with some free time. This western wall of the Rift Valley escarpment is truly stunning. It provides a backdrop for your search for the park's phenomenal bird life (including raptors), tree-climbing lions, elephants, zebras, hippos, baboons, and buffalos. Look up and see some of the more than 400 species of birds, including pink flamingos, pelicans, cormorants, and storks. 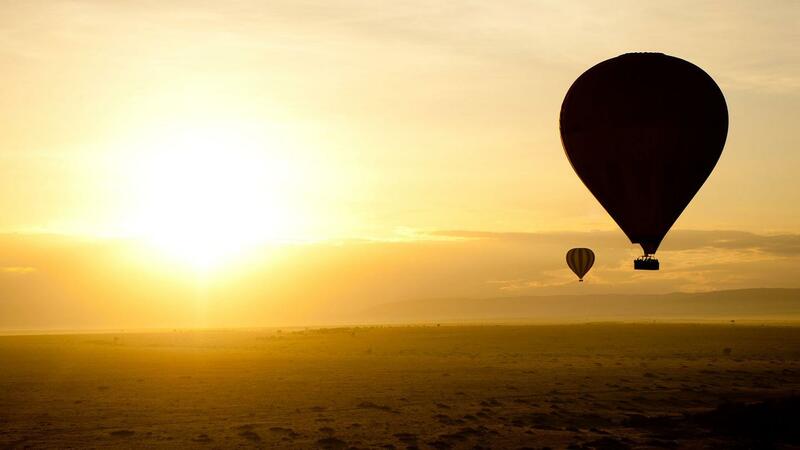 Spirited aloft in a hot-air balloon, view the wildlife and terrain of the Serengeti that only the birds see. Enjoy a champagne breakfast and keep that shutter-finger good and limber-you’ll be using it plenty over the course of your hour in the air. 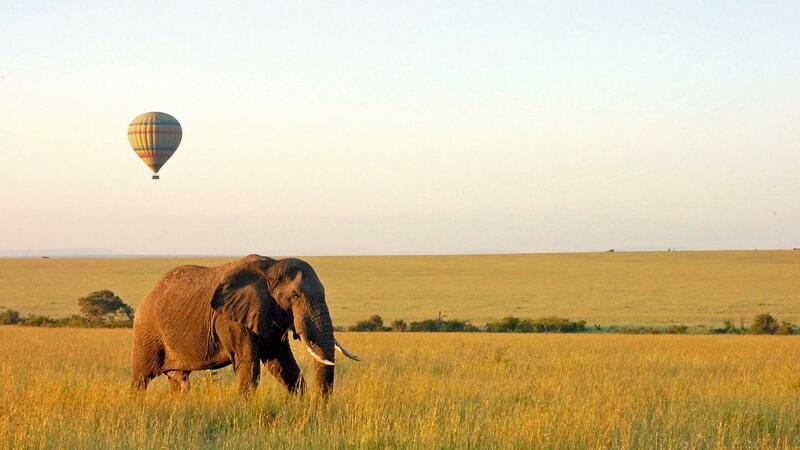 Simple hotels (3 nts), full-service camping (4 nts), permanent tented camp (2 nts). 9 breakfasts, 8 lunches, 5 dinners. The adventure begins just before dawn and lasts an hour in the sky. 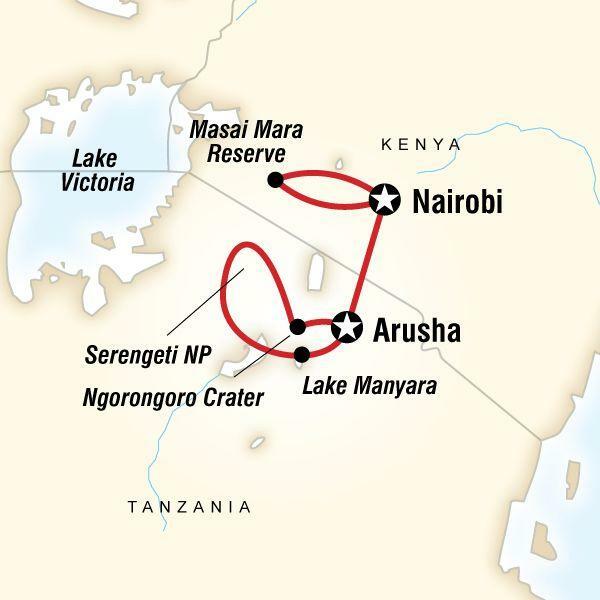 Fly over the Mara River, plains, and forests of the Masai Mara. Toast your return to earth with a champagne breakfast, cooked wherever you land. Please note that single passengers can book on this activity, the balloon will require a minimum of two passengers to take flight. In the rare case that this minimum is not reached by the time of your flight, passengers will be refunded for this activity. G Adventures for Good: Clean Cookstove Project Visit, Mto wa Mbu. 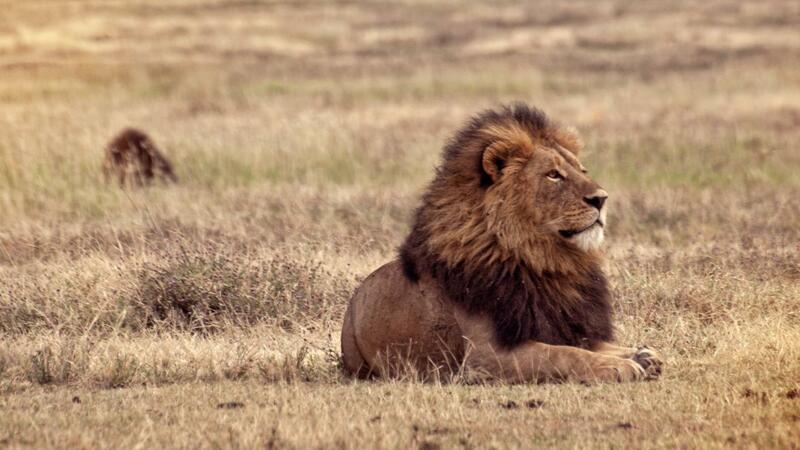 Masai Mara National Reserve entrance and wildlife safari drives. Lake Manyara wildlife safari drive. 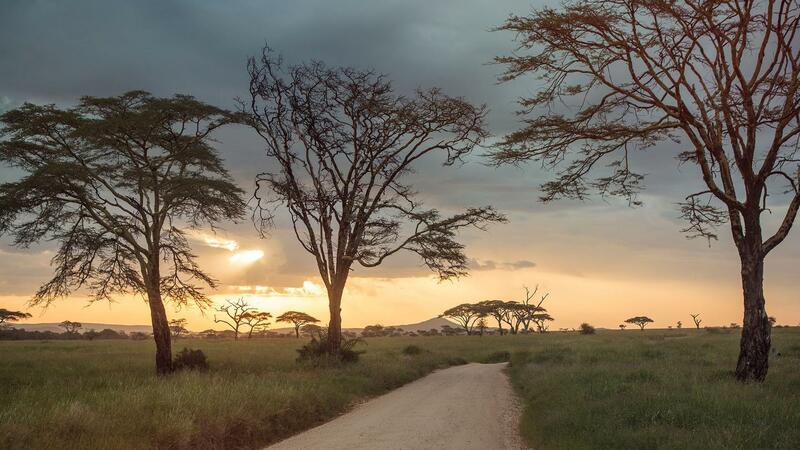 Serengeti wildlife safari drives. Ngorongoro Crater wildlife safari drive. All transport between destinations and to/from included activities. Photograph incredible wildlife on safari drives, meet the Maasai people, savour a traditional lunch in a local community, search for the Big Five. If you have not arranged an arrival transfer please make your way to the joining hotel. Jomo Kenyatta International Airport is about 20 km from downtown and your hotel. There are a variety of ways to get into the city. The dedicated airport bus takes about 40min at USD 5, however an airport taxi is recommended. This can be booked either inside the airport at an 'information desk' or outside of the terminal. The price is approximately USD 20. If you have pre-booked an airport transfer, it is necessary to make contact with our representative, who waits with a G Adventures sign outside the secure baggage-retrieval area, within 1.5 hours (90 minutes) of your flight's scheduled arrival time. No refunds will be granted if you fail to make contact with our representative within this reasonable time. After such time, we recommend that you make your own way to the Starting Point hotel, following the Joining Instructions. *Important note* If you are advised of the flight schedule change within 48 hours of your scheduled arrival time, please contact the airport transfer operator listed as the emergency contact for your tour which can be found below. We will do our best to rearrange your arrival transfer however we cannot guarantee this. If your arrival transfer does not arrive within 30 minutes after you have exited the arrivals area please take a taxi to your start point hotel. A visa for Tanzania can be obtained when entering the country by land with the group, for most nationals for a standard fee of US$50, though the current cost of a Tanzanian Visa for U.S. nationals is $100. This is also valid for up to 3 months, with multiple entries among Uganda and Kenya permitted. Please note that Kenya is now strictly enforcing a "blank pages, condition of entry". All those requiring a visa on arrival must have at least two blank pages available in their passports. Failure to meet this requirement could mean that entry will be refused. This information is accurate at the time of writing. Though as fees and policies can change, we highly recommend that you contact your local embassy or consulate for the most up-to-date visa requirements, or see your travel agent. It is your responsibility to have the correct travel documentation. There are generally two rainy seasons - the short and the long rains. The short rains normally occur from late October through November, and the long rains from late March through to early June. A good time to visit is between late June and October when the rains have finished and the air is coolest. Alternatively, from late December to early March is another good time to visit, just after the short rains, but before the long rains; this is the warmest time of the year. The highest season for travellers into the region is in January and February, when the hot, dry weather is generally considered to be the most pleasant. During the rainy season it can be deceptively cold at times and evenings can be cool year round, so ensure you have adequate warm clothing such a fleece or warm sweater. The electric current in Kenya operates on 220 volts. Electric plugs types come in at least four sizes and vary throughout the country, however, the two rounded pin standard plug is acceptable in most parts of the country. 3 pin square plugs are most common. The electric current in Tanzania operates on 230V, 50Hz. The population is over 30 million and has one of the world’s fastest growth rates. Kenya gained independence in 1963 after 80 years of British rule. • Most Kenyans are subsistence farmers. Coffee and tea are grown commercially and tourism is also a huge income for the country. The country is still in huge debt though and has few mineral resources and corruption is again a problem. The country lies on the equator and has good national parks and Mount Kenya the second highest peak in Africa. It also has good beaches and colourful people. Nairobi is the capital and Mombassa the countries port city. The name is name made up from an amalgamation of TANganyika and ZANzibar. Tanzania is the largest country in East Africa (although not in Africa as a whole, the Sudan is 3 times larger); it’s landmass covering an area of just over 945,087 sq. km (including Zanzibar). This makes Tanzania about the size of France, Germany and Switzerland combined; 3 times the size of the entire British Isles or one-tenth the size of the whole of the USA. Tanzania’s population at the last official census was 31.3 million, with approximately one third being classified as “urban”. Agriculture forms roughly half of GDP and agriproducts (e.g. : coffee, tea, tobacco, cashew nut, sisal, cotton) some 75% of export earnings. • Dodoma, in central Tanzania, is the political capital of the country although Dar es Salaam is the effective trading and business capital, with its safe harbour ("Dar es Salaam” means “Haven of Peace”), international airport and population of some 1.75million. Shillings can be obtained locally by changing foreign currency or by using ATMs (where available) which will disperse local currency. Your CEO will inform you where you can change money throughout the tour and approximately how much money you will need for each country. The easiest foreign currency to exchange for locally for any of the local currencies is the $US; however the British Pound and Euro may also be exchanged as well. Please note that due to past problems with forgery, $US notes that are older than year 2006 are not accepted in Africa. Restaurant/café servers: 10% of the cost of the bill. Always leave your passport (It’s better to carry a photocopy of it instead), traveller’s cheques, flight tickets and money that you won’t be using in the safe deposit in your hotel room/reception. This is free of charge to G Adventures Adventure clients. Remember that like in any other city, you should never leave your bags unattended, nor flaunt jewellery, cameras etc. Please don’t wander through the city at night. Stick to the main streets only during the day, and after sundown, please take a taxi. Taxis can be organised from reception of your hotel. Also, take the address of the hotel with you. People are generally friendly, but don’t let people take advantage of you, especially the sales people! Beware of people approaching you on the street with an apparent interest of where you are from, and want to sit down and have a chat with you. These people are most likely con men and try to get money from you in one way or another. People on the street who ask you if you want a safari and have a brochure are often con men, best to avoid these folk. Besides, you’re already on safari!